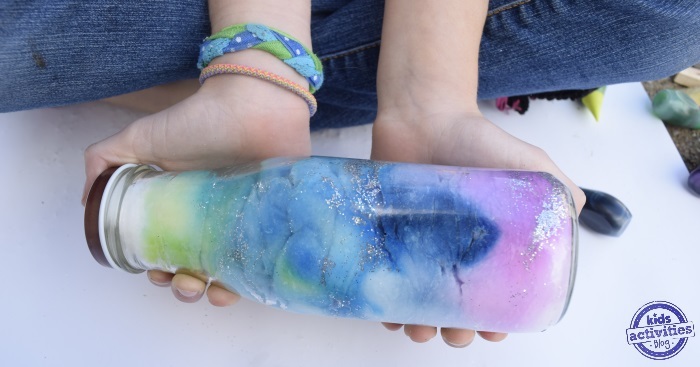 Galaxy Jars (Sensory bottles) are fun for kids, but what if your kids, no longer call themselves “kids”? But they still love crafts? This is the sensory bottle for them! 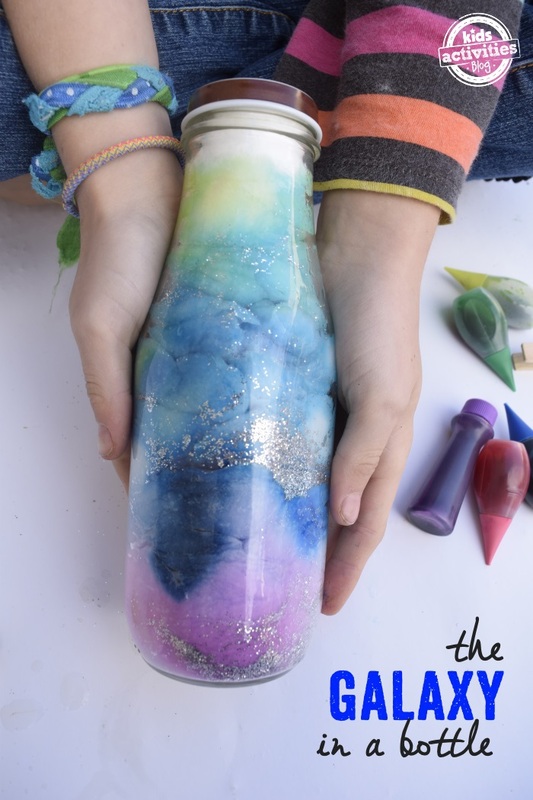 This glowing galaxy in a jar is fun and easy to make – the more “grown-up” version of our Counting Stars Glowing Bottle, do not require mom’s involvement (even younger elementary kids can make them independently) and the finished product is great to put on display near a bed. Clear glass bottle with a lid. Cotton balls – lots and lots of cotton balls. 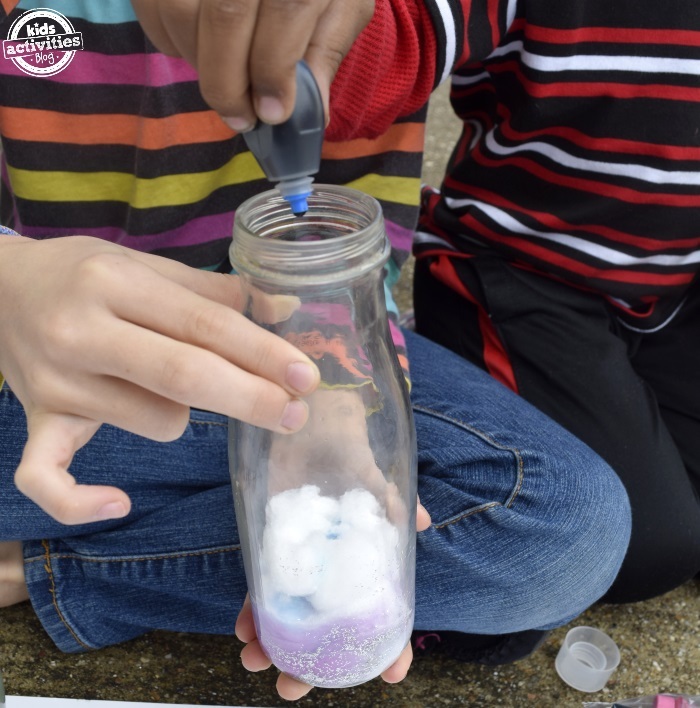 Fill your bottle half-full with cotton balls. You will compress the cotton balls – they will fill the lower inch of the bottle when you are finished. Pour some water into the bottle, enough to saturate the cotton balls. Drip 2-3 drops of food coloring into your bottle. Add a squirt of glow paint and a dash of glitter. Then – do it all again! Add more cotton balls, more water, more glitter and glowy juice. We found that as the layers grow it gets harder and harder to fill the jar. Using a stiff straw to tamper the cotton balls back down into their layer helps. Keep adding new colors and new layers until your bottle is completely full. Put the lid on your bottle securely. 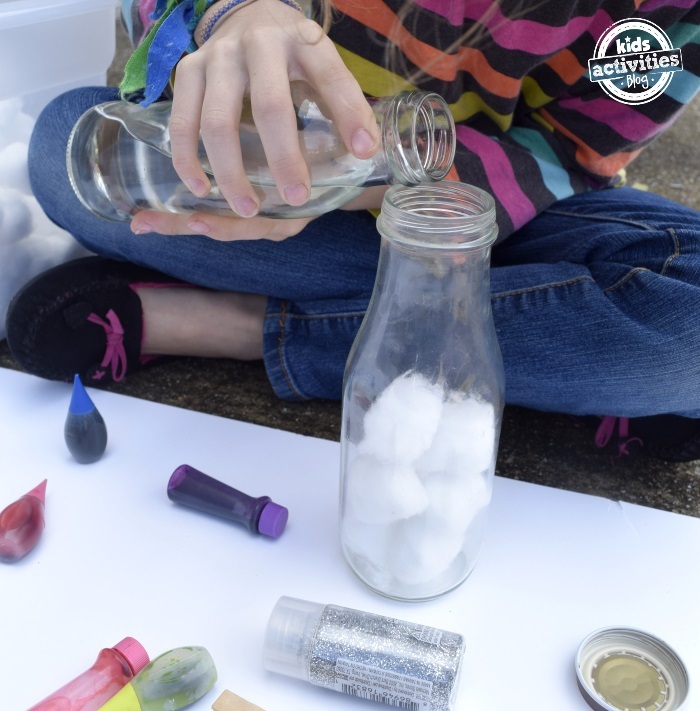 As your bottle ages, you will want to rehydrate the cotton balls to keep the blurred “sky look”. Set the bottle on your windowsil to allow the glow paint to charge. 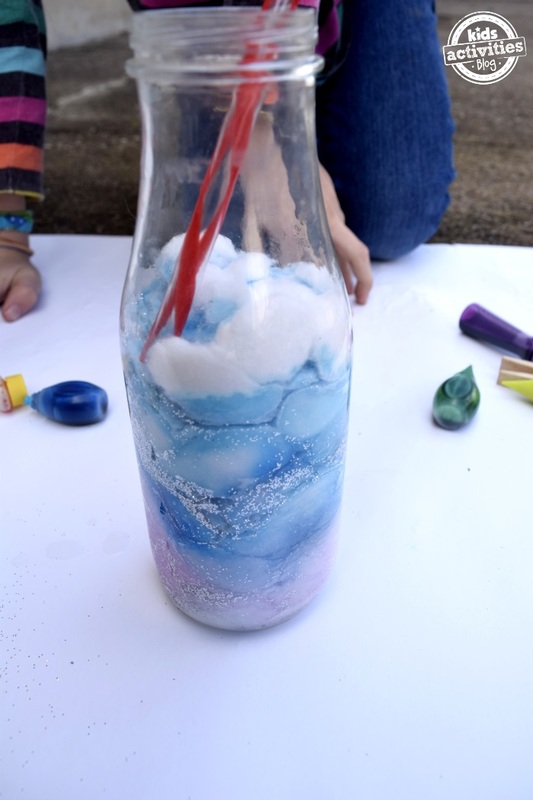 As your kids drift to sleep they will see a sky, including a glittery milky way looking back at them, from their galaxy bottle. My tween is making these for all of her friends for their Homemade Christmas Swap get together. She is collecting glass bottles!